This week I got to do something I've been wanting to do for awhile. I was invited by Andrew Donaldson of The Marshes Golf Club for a Ping Iron Fitting. In fact is was for the new G25 line of irons that just came out recently. When Andrew first posted the picture of the G25 iron on Twitter I was intrigue as it definitively fit my eye. So I was more than excited to hit the Marshes Indoor Studio this past Tuesday to get fitted for some G25 irons. The first step in getting a proper fitting is whats called the Interview Process which I didn't even realize I was going through with Andrew as I warmed up by hitting my own 9 iron into the indoor studio. Andrew asked me a series of questions regarding my present iron makeup and ball flight. I currently own a set of TaylorMade Burner 2.0 irons 5 iron through AW with KBS Tour Stiff Shafts. My ball flight is right to left (draw) my real bad misses tend to be hooks. I have a medium ball flight when it comes to trajectory. I'd definitely still want to keep my draw but go with a bit higher ball trajectory. The second part of the fitting was a Static Fitting which I found interesting because I finally got to understand the Ping Color Code Chart better. 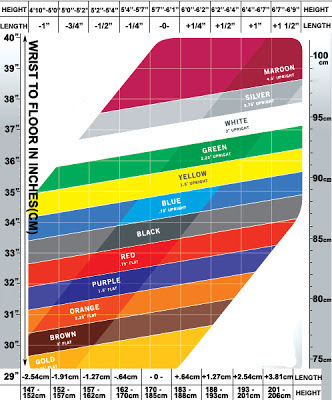 Andrew took my height (6'5") and wrist-to-floor measurement (36") and these measurements were used to calculate my static Iron Color Code (Yellow Dot 1.5 degrees upright) and shaft length (+1"). My hand dimensions were also measured my Andrew Total hand size(8.5") as well as longest finger(3.75") to calculate my static Grip Color Code (Gold(+1/32"), or grip thickness. Now came the fun parts The Dynamic Swing Test and the Ball Flight Analysis. Where you actually get to hit a G25 7 iron. Andrew initially tried different lengths of shafts with impact tape on the face of the irons. At the time I had no idea if I was playing a regular shaft or a stiff. Andrew was just trying to see from the impact tape on the face of the club where I was hitting the ball from my type of swing. Optimal being the middle of the face of the club. After numerous swings the impact tape reveal that I would need a shaft that plays at +1/2 ". Then we moved on to the impact board where Andrew taped the sole of the club to get feedback from the sole of the club. When the club hits the board, it leaves marks on the tape that gave Andrew an idea to my setup and how my swing affects the position of the clubhead at impact. After I hit numerous balls off the impact board it was made clear from the impact tape and Ball Flight Analysis that I wouldn't need Yellow Dot irons. From all my swings Andrew was able to conclude I actually need my irons more flat Red Dot (.75 degrees flat) do in part to the way I impact the ball. At this point Andrew told me I had been hitting the G25 with a Regular Ping CFS Shaft. So I then hit a bunch of shots with a Stiff Ping CFS Shaft. Comparing the values like launch angle, carry distance, deviation, etc. to the Regular shaft. The Ball Flight Analysis was the most important part of the process. Andrew used a variety of clubs with slightly different specifications to isolate each fitting variable and determine the combination of Color Code, club length, shaft type and flex, club model and grip size that gave me best opportunity to achieve your desired ball flight. Final step of the Ping Fitting is Monitoring Performance. A golfers swing can change over time. So the Monitoring Performance is an ongoing periodic evaluation of your ball flight. A swing change, club adjustment or a combination of both may be necessary to resolve or eliminate any variation in desired ball flight. What a great experience going through a Ping Iron Fitting. The G25 was a great iron I loved the feel, look and the game improvement qualities of the irons. I want to try a fitting outside before I commit to a set but I know it will happen. It will only improve my love for the game. BTW- He also does fittings for Titleist and Mizuno. Will definitely be setting up a driver fitting with Andrew. I can see the G25 in my future. I am really admired for the great info is visible in this blog.